As a successful Kickstarter project in 2012, Brydge started off as an aluminum keyboard product for the iPad. Since then, Brydge has solidified as a company, producing high-end keyboards for tablet PC’s and products, giving those products a true laptop look and feel. They have products out now for the Pixel Slate as well as various iPad, Microsoft Surface Pro, Google Chrome products. When we encountered Brydge at CES 2019, we just had to look into what exactly Brydge brings to the table. As such, we are taking the Brydge 12.3 for the Microsoft Surface Pro through its paces for a proper review. Let’s dive in. 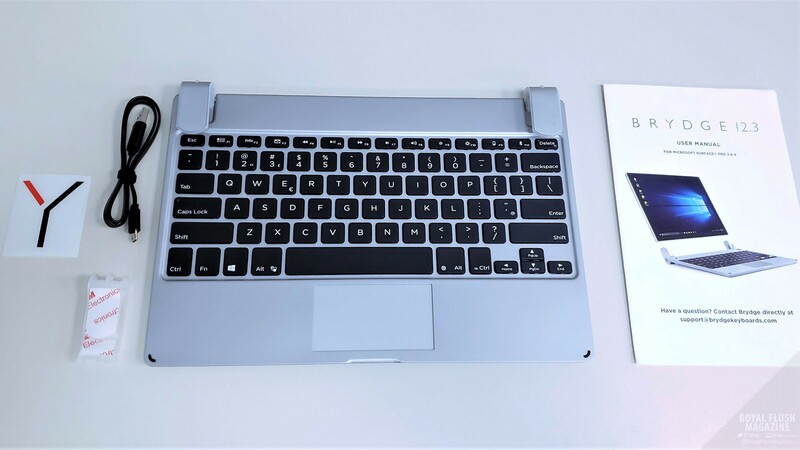 Brydge’s aluminum keyboard and trackpad hybrid covers a wide variety of devices, with each Brydge keyboard designed to conform neatly with the product that it connects to. What you end up with is a sleek laptop experience where your tablet product can be comfortably used on any surface, even your lap. Gone are the days of setting your tablet device on your lap using wobbly or unsecure stands. Here, the Brydge 12.3 is designed for the Surface Pro 3, Surface Pro 4, Surface Pro 5, and Surface Pro 6. Simply slide your compatible Surface Pro product into the rubberized hinge shims, connect the Brydge 12.3 to your device via Bluetooth, and you have transformed your Microsoft Surface Pro into a clamshell laptop. The Brydge 12.3 comes ready for the Microsoft Surface Pro 4 and Surface Pro devices after that. However, there are also replacement shims included should you own a Surface Pro 3, as I do. Replacing the shims was easy enough, and it gave me the added bonus of appreciating exactly how they work. These rubber contacts do more than act as grips for your connected device. The hinges also tilt the keyboard slightly when the “clamshell” is open as well as provide additional grip contact against the surface you are laying the Surface Pro and keyboard on. When the Surface Pro and Brydge 12.3 combo is closed, you still have a fairly compact combo that fits neatly in most 14 to 15-inch laptop sleeves. The Brydge 12.3 uses Bluetooth 3.0 and features a QWERTY keyboard housing a glass trackpad, capable of recognizing multi-finger gestures. The keyboard recharges via microUSB, where a full charge gives you a 3-month lifespan at a usage rate of 2 hours a day. The Brydge 12.3’s keyboard also includes all of the often-used shortcut keys that you find in pretty much any laptop keyboard nowadays. You have shortcut keys for media controls, volume, screen brightness, print screen, and trackpad-disabling for when you prefer to use the touchscreen or a mouse. Additional practical shortcut keys are also available for Bluetooth pairing, checking the keyboard’s battery level, and toggling the brightness of the back-lit keyboard. 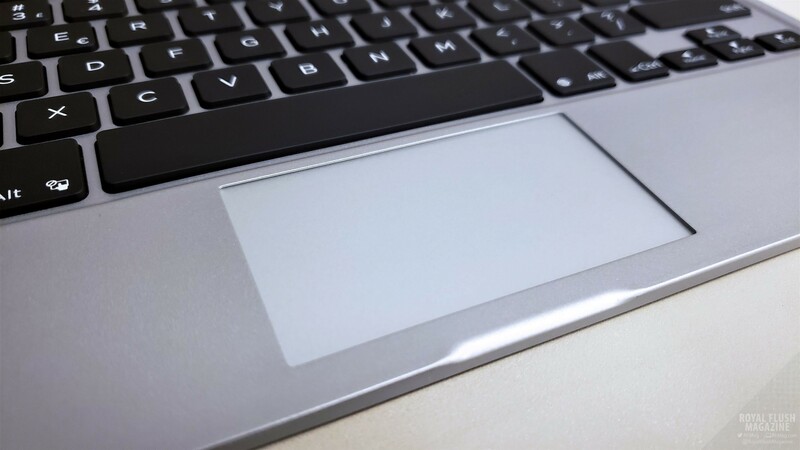 With the Microsoft Surface Pro already having a keyboard and trackpad solution in place in the Surface Pro Type Cover, you might ask why one would look towards Brydge’s solution. The Surface Pro Type Cover protects your screen, gives you a QWERTY keyboard with touchpad, and is easy to use on flat surfaces. However, having used the Microsoft Surface Pro 3 since its launch, the benefits of the Brydge 12.3 over the Surface Pro Type Cover quickly became clear to me. The most immediate and obvious improvement was in ease of typing. As sturdy as the Surface Pro Type Cover has become as of late, it is difficult for it to perfectly match the stability of an aluminum keyboard with rubberized feet. Typing with the Brydge 12.3 on any surface is simply a dream. The Brydge 12.3’s stable chiclet keyboard feels solid to type on and is extremely quiet. The Brydge 12.3’s strong hinges held onto my Surface Pro 3 like the Jaws of Life. I had full confidence that neither the keyboard, nor the Surface Pro were going to detach from each other, regardless of how I held either product. This remained true in all of the Brydge 12.3’s viewing angles, ranging all the way up to 180 degrees. When you assigned a tilt to the Surface Pro, the strong hinges held the viewing angle just as you left it. This opened up the Surface Pro 3 to all kinds of typing scenarios, even ones which were once tricky with the Surface Pro Type Cover depending on the viewing angle. Here, I am referring specifically to using the Surface Pro on one’s lap. Of course, the Surface Pro with Surface Pro Type Cover can indeed be used on one’s lap. This is what I have been doing for years, after all. However, the deeper the tilt I put in the Surface Pro 3’s viewing angle, the more unstable the setup became on my lap. This was especially annoying in scenarios where I lacked leg room or was sitting at events where people had to often pass my seat to enter to and from the aisle. I later found that removing the Surface Pro Type Cover and typing using the on-screen touch keyboard to be the best course of action in those scenarios. Now, long-term lap typing with the Microsoft Surface Pro is no longer the chore it has the potential of being. With the Brydge 12.3, I have a secure typing base that stays planted on my lap, regardless of the viewing angle and without involving the Surface Pro’s stand. The glass trackpad is slick and responsive, accurately reacting to multi-finger gestures such as minimize all and pinches for zooming in and out. Since the Surface Pro is all-in-one in its design, you do not have to worry about the warm lap experience that you get with typing with other laptops. All of the natural computer-generated heat stays suspended away from your lap as the Brydge 12.3 keeps your legs nice and cool during the longer typing sessions. You also have a naturally easier-to-clean keyboard with the Brydge 12.3 than you do with any of the fabric-skinned Surface Pro Type Covers. I was very impressed with the reported 3-month lifespan of a fully-charged Brydge 12.3, where a full charge is set to keep your Brydge 12.3 running for even the longest of business trips. The Brydge 12.3 is a big win for me. 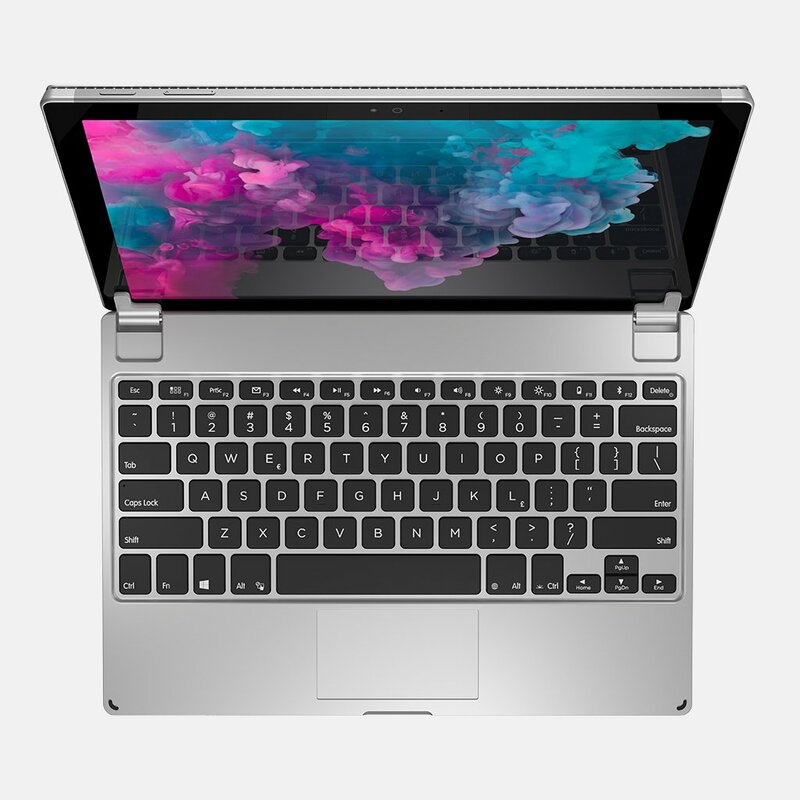 It is priced at $129.99, matching the price of the Surface Pro Type Cover while coming in cheaper than the fancier Surface Pro Type Cover with Fingerprint ID and Surface Pro Signature Type Cover, each priced at $159.99. The Brydge 12.3 doesn’t have a fingerprint sensor, but it doesn’t need one either. However, the Brydge 12.3 will give your Surface Pro considerably more girth and weight than Microsoft’s keyboard solutions. In fact, it more than doubled in each of those categories, as it brought the Surface Pro 3’s weight up from 1.75 lbs. to a total of 3.58 lbs. 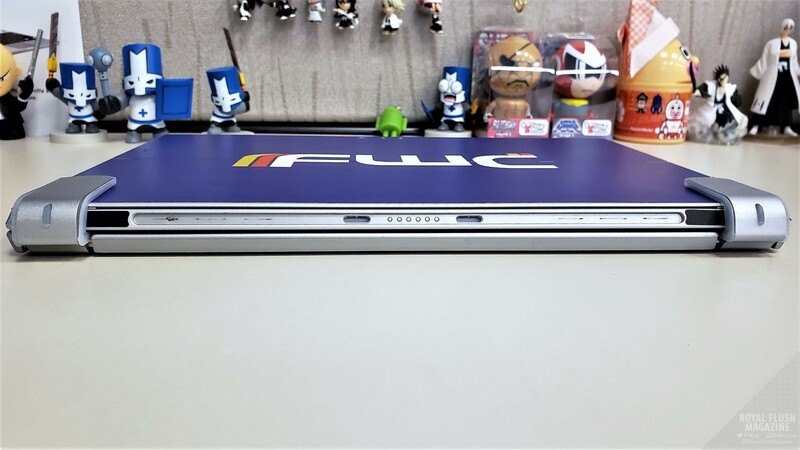 If sleekness and weight are deciding factors in your laptop purchases, then you will definitely have to consider this when comparing the Brydge 12.3 to the Type Cover. However, if typing stability and comfort is your diving point for a keyboard purchase, then I would suggest you go for the competitively-priced Brydge 12.3. In terms of comfort and ease of use, the Brydge 12.3 won hands down and has promptly replaced my Surface Pro Type Cover going forward. If you have any Surface Pro after the Surface Pro 3, definitely look into the $129.99 Brydge 12.3 keyboard for yourself here. If you have another tablet device that you plan to do some long-term typing on, take a look at Brydge’s collections of keyboards and other accessories. They may have something you like. † Brydge 12.3 keyboard for the Surface Pro 3, Surface Pro 4, Surface Pro 5, and Surface Pro 6 provided by Brydge PR for review.